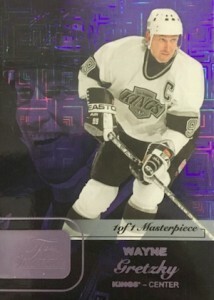 Tapping into the rich history of the Fleer and Skybox brands, Upper Deck's 2015-16 Fleer Showcase Hockey combines the 1990s with modern hit expectations and a heavy dose of rookies. Each box includes one rookie autograph patch, two more hits, and several inserts and parallels. 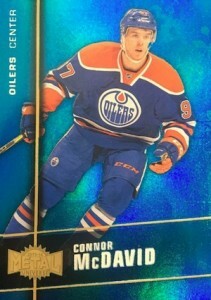 Largely mirroring the 14-15 edition, a moderate 100-card base set is enhanced by limited parallels like Red Glow and White Hot that add a jersey patch piece. 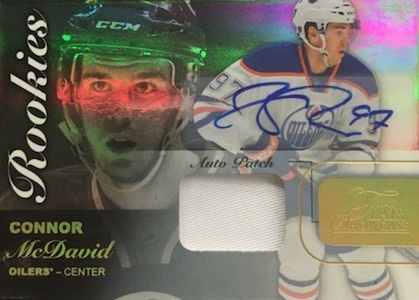 A key option for rookie collectors, Hot Prospects autograph patches drop one per box and are numbered to 499 or 299 and include Red Glow (#/25) and White Hot (#/5) parallels. 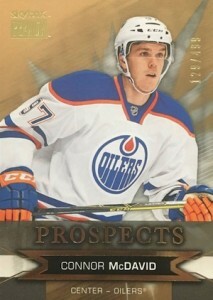 There are also Hot Prospects Duos (#/399) and Trios (#/599) versions with Red Glow (#/25) and White Hot (#/5) parallels. Other signed choices include up to 30 Flair Rookie Autograph Patches, each numbered to 65 or less. Given the nostalgia factor and reputation of the brands included, inserts are a major focus in Fleer Showcase and fall one per pack. Building on Metal Universe Rookies (1:4 packs), collectors are treated to one of the top parallels of the nineties. 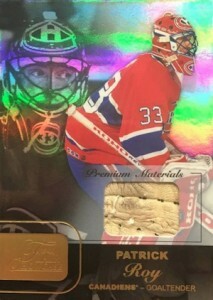 The famed Precious Metal Gems (or PMGs) are featured with Red (#/150), Blue (#/50), Green (#/10) and Purple (#/5) options. Additional hobby favorites come in the form of Fleer Ultra Rookies (#/699), with Platinum (#/99) and Violet Medallions (#/25), and Skybox Premium Prospects (#/499) with Star Rubies (#/50) and Sparking Diamonds (#/5). Flair Showcase offers Flair Row 1 (1:6 packs), Row 0 Rookies (1:14 packs), Blue Ice (#/199 or 99) and one-of-one Masterpiece cards. Bringing more to the table, Row 1 Materials (1:36 packs) and Premium Materials (#'d) are joined by Row 0 Rookies Materials (1:18) and Auto Patch (#/65 or 35). All subjects not included in the parallels. View specific parallel info with the full spreadsheet. 35 cards. 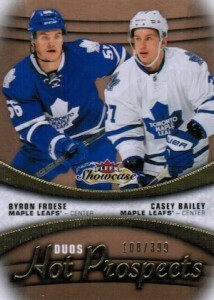 Trios - #/599, Duos - #/399. Overall Odds: Row 1 - 1:6 packs, Row 0 - 1:13 packs. 61 cards. Specific group odds noted below. Overall odds: Row 1 - 1:30 packs; Row 0 - 1:18 packs. 30 cards - 1:4 packs. 30 cards. Serial Numbered #/499. 30 cards. 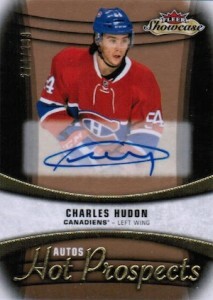 Serial Numbered #/699. Trey, Product looks nice/clean! Will this product also be in a retail format? I am DISGUSTED by Upper Deck. Shame on them!! After I broke two cases, half of the RPA are white cloths!! 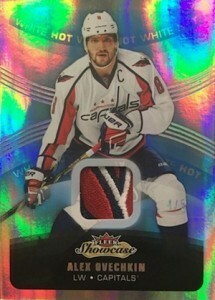 I pull a Hot Ice Girgensons #/15 and it’s a freaking white cloth!!! What the hell is wrong with this company!? Don’t they have any respect for clients anymore. Sure they make one freaking billion cases if for these imbeciles a patch means a white cloth! A pity, because the product looked decent, but I would give them 0 stars if I could. This is what happens when you let one company hold a monopoly on hockey. Quality goes right down the toilet because there is no competition to keep them honest. Overpriced! Greed Monkeys! Guess Im a sucker but this product is weak. Design rather ordinary, the serial numbers are high, white cloths presented as patches all over the place, printing issues on 3 of the low numbered cards I pulled, weak checklist with teams that get 4-5 players and others that get only 2. Where are the young players? Where are Ekblad, Klingberg, Horvat, Morgan Rielly, Elias Lindholm, Kuznetsov, etc. ? I understand you need to put old stars, but there are some active players that should be only in OPC and perhaps Series 1 and 2: Sam Gagner, Hornqvist, Hudler, Thornton, etc. I don’t deny the value of these players, but I’m pretty sure collectors are more into fresh, talented young players. All in all, stay away from this product. It’s overpriced and has a lot of issues. Only 3 stars because the product is flooded with rookies that shouldn’t be included. 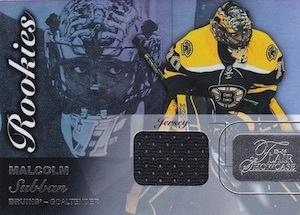 Other than that both rookie patches were quality 3 color patches. Amazing product. Quality value too. Prices are holding steady and even rising. Loving this product. Better then SPX, but that isn’t saying much (SPX is by far the worst product released in the past 3 years.) This product is another in a long line of Connor or die. Where is the innovation UD?? Designs are nice in Showcase, but that is really it. UD has been mailing it in for a year. They will not keep the exclusive when it is over, that is certain. Great product. UD innovatoon is second to none. Pulled PMG PURPLE Larkin! out of three packs I pulled a blue ice parallel a josh anderson rookie auto patch and a sergei plotnikov auto patch rookie redemption! Had low expectations of this product when I bought my first box, but I can say I am pleasantly surprised. 3 boxes and I’ve gotten good value out of each one. Box last night produced a redemption for Panarin Auto Patch, so hopefully it is a nice patch when it arrives! LOVE the PMG cards. They are beautiful. 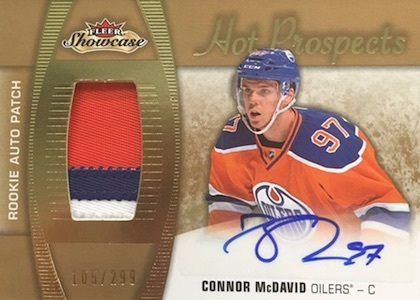 I’ve got a red and blue McDavid, and two of the purple from the employee exclusive set from Upper Deck. 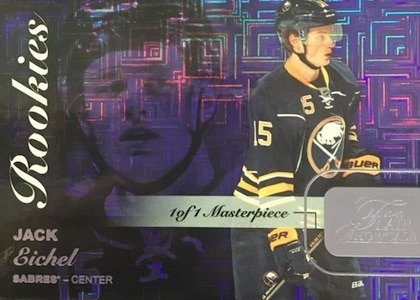 They made a first ever rookie set of six PMG cards including McDavid, Eichel, Larkin, Ehlers, Domi and Bennett, and gave the set as a gift to 150 employees. 3-4 employees listed the cards as singles. 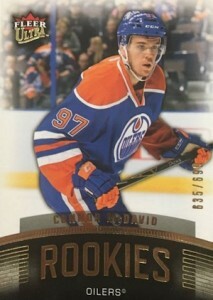 I managed to get two McDavids. I couldn’t believe more people weren’t trying to snapping them up. Along side the Fleer PMG, they look awesome!